Many of us still in confuse in understanding lease classification, especially leases that involving land, building and equipment [Real Estate]. From comments arisen so far, the confusion is mostly on the classification [e.g. ; on lessee’s book, should the building lease be classified as a capital or operating lease? Should the lease be classified as sales-type or as direct financing [leveraged lease] on lessor’s book? How if the leases involving land only? How if the leases involving land and building in one lease agreement? How if the lease involving only part pf a building? How if the leases involving equipment as part of the building? And, how if the leases involving facilities owned by goverment? So many questions haven’t been addressed yet. Through this post I will solely discuss leases classification involving land, building and equipment [real estate]. Hope this post favorably answers all those questions and expands our knowledge in lease accounting. What agreements are considered leases? Financial Accounting Standards Board (FASB) Statement No. 13, Accounting for Leases, defines a lease as an agreement conveying the right to use property, plant, or equipment (land or depreciable assets or both) usually for a stated period of time. The classification of leases involving land, building and equipment [real estate] builds upon the general lease classification criteria established by FASB Statement 13 for all leases. The lease classification criteria are generally applied on an asset-by–asset basis, with functionally interdependent equipment (such as computer desktop, monitor, and keyboard) being considered one asset. FASB Statement 13 does not provide for the application of the lease classification criteria to groups of assets. The classification of a lease is determined at lease inception (which is the date of the lease agreement or commitment, if earlier) and not at the beginning of the lease term. For accounting purposes, the beginning of the lease term is the date the lessee takes physical possession of the leased asset, which does not necessarily coincide with the beginning of the lease term stated in the lease agreement. For a lease involving real estate with a fair value different from its carrying amount, the lease is classified as a sales-type lease only if the lease transfers ownership of the property to the lessee by the end of the lease term. Otherwise, such lease is classified as operating lease. Additionally, special accounting rules apply to leases involving facilities owned by governmental units. The lessee accounts for the lease as a capital lease, otherwise as an operating lease. Criteria 3 (75 % of economic life test) and Criteria 4 (90 % of fair value test) ARE NOT APPLICABLE TO LAND LEASE. Why? Because land has eternal economic life, therefore it is never depreciated. Collectability of the minimum lease payments is reasonably predictable. No important uncertainties surround the amount of un-reimbursable costs yet to be incurred by the lessor under the lease. If the lease does not meet both of these criteria, the lessor accounts for the lease as an operating lease. No important uncertainties surround the amount of un-reimbursable costs to be incurred by the lessor under the lease. If the lease does not meet these two criteria, the lessor accounts for the lease as an operating lease. Criteria 3. and 4. (75 % of economic life test; 90 % of fair value test) are not applicable to land leases. If the lease is classified as a “capital lease“, land and building are capitalized separately by the lessee. The present value of the minimum lease payments (after deducting executory costs and any profit thereon) is allocated between land and building in proportion to their fair values at the inception of the lease. The building is amortized consistent with the lessee’s normal depreciation policy for owned assets. Criterion 3 & 4. [75 % Of Economic Life Test And 90 % Of Fair Value Test]. If the lease does not transfer title to the real property and does not contain a bargain purchase option, the lessee has to determine the fair value of the land as compared to the fair value of the real estate property leased. [a]. If the fair value of the land is less than 25 % of the fair value of the leased property, land and building are considered a single unit for purposes of applying criteria 3 and 4 [75 % of economic life test; 90 % of fair value test]. If either criterion 3(75 % of economic life test) or 4 (90 % of fair value test) is met the lessee capitalizes land and building as a single unit and amortizes that unit consistently with the lessee’s normal depreciation policy for buildings, except that the period of amortization is the lease term. The leased asset is amortized to its expected value to the lessee at the end of the lease term. For example: if the lessee guarantees a residual value at the end of the lease term and has no interest in any excess that may be realized, the expected value of the leased property to the lessee is the amount that can be realized by the lessee from the leased property at the end of the lease term, up to the amount of the residual value guarantee. If the lease meets neither the 75 % of useful life test nor the 90 % of fair value test, land and building are accounted for as a single operating lease. [c]. Fair value of land equals or exceeds 25 % of the fair value of leased property. For a lease of land and building that does not transfer title and does not contain a bargain purchase option, land and building are considered separately for purposes of applying the 75 % of economic life test and the 90 % of fair value test, if the fair value of the land equals or exceeds 25 % of the total fair value of the leased property at the inception of the lease. The minimum lease payments (after deducting executory costs including any profit thereon) applicable to the land and the building are separated by determining the fair value of the land and applying the lessee’s incremental borrowing rate to it to determine the annual minimum lease payments applicable to the land element. The remaining minimum lease payments are attributed to the building element. If the building element of the lease meets the 75 % of economic life test or the 90 % of fair value test, the building element is accounted for as a capital lease and amortized consistently with the lessee ’ s normal depreciation policy, except that the period of amortization is the lease term rather than the useful life of the building. The building is amortized to its expected value to the lessee at the end of the lease term, up to the amount of a residual value guarantee. The land element of the lease is accounted for separately as an operating lease. If the building element of the lease meets neither the 75 % of economic life test nor the 90 % of fair value test, both the building element and the land element are accounted for as a single operating lease. Are those explaination too complicated? The following graph better illustrates the lease classification for leases involving land and building from the perspective of the lessee. Collectibility of the minimum lease payments is reasonably predictable. Otherwise, the lessor accounts for the lease as an operating lease. For purposes of the 75 % of economic life test, the estimated economic life of the building is considered to be the estimated economic life of the unit. No important uncertainties surround the amount of un-reimbursable costs yet to be incurred by the lessor under the lease the lessor accounts for the lease as a single unit as a direct financing lease or a leveraged lease. Otherwise, the lease is accounted for as an operating lease. [b]. 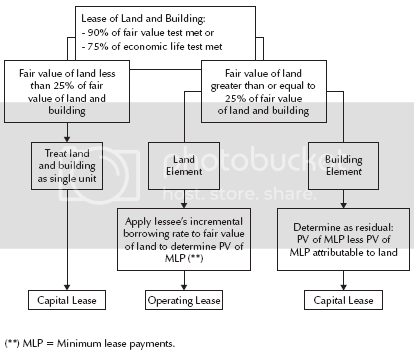 The lessor should consider land and building separately for purposes of applying the 75% of economic life test and the 90 % of fair value test 64 if the fair value of the land equals or exceeds 25 % of the total fair value of the leased property at the inception of the lease and the lease does not either transfer title or contain a bargain purchase option. No important uncertainties surround the amount of unreimbursable costs yet to be incurred by the lessor under the lease the building element is accounted for as a direct financing lease or a leveraged lease. The land element of the lease is accounted for separately as an operating lease. Otherwise, both the building element and the land element are accounted for as a single operating lease. This Section refers to leases that involve equipment other than integral equipment. Integral equipment subject to a lease is considered real estate. In EITF Issue No. 00- 13, Determining Whether Equipment is “Integral Equipment” Subject to FASB Statements No. 66 and No. 98, the Task Force addressed the issue of when equipment constitutes integral equipment. The Task Force reached a consensus that if the cost to remove the equipment plus the decrease in value 68 is in excess of 10% of the equipment ’ s fair value, the equipment is considered “integral equipment”. If a lease involving real estate includes equipment that does not meet the criteria of integral equipment, the equipment lease is considered a lease separate from the lease of the land and building. Accordingly, the portion of the minimum lease payments applicable to the equipment element of the lease needs to be estimated. FASB Statement No. 13 does not specify any particular methodology to be used for that allocation. When the leased property is part of a larger whole, the carrying amount of the leased portion or its fair value may not be objectively determinable, as for example, when an office or floor of a building is leased. The accounting for leases involving only part of a building depends on whether the carrying amount and fair value of the leased property are objectively determinable. Fair Value Objectively Determinable. If the fair value of the leased property is objectively determinable, the lessee classifies and accounts for the lease according to the provisions for leases involving land and building. Fair Value Not Objectively Determinable. If the fair value of the leased property is not objectively determinable, the lessee accounts for the lease as an operating lease, unless the 75 % of economic life test is met, using the estimated economic life of the building in which the leased premises are located. If the 75% of economic life test is met, the leased property is capitalized as a single unit and amortized in a manner consistent with the lessee’s normal depreciation policy, except that the period of amortization is the lease term. The asset is amortized to its expected value to the lessee at the end of the lease term. Carrying Amount And Fair Value Determinable. If the carrying amount and fair value of the leased property are objectively determinable, the lessor classifies and accounts for the lease according to the provisions of leases involving land and building. Carrying Amount Or Fair Value Not Objectively Determinable. If either the carrying amount or the fair value of the leased property is not objectively determinable, the lessor accounts for the lease as an operating lease. Because of special provisions normally present in leases involving terminal space and other airport facilities owned by a governmental unit or authority, the economic life of such facilities for purposes of classifying the lease is essentially indeterminate. Similarly, the concept of fair value is not applicable to leases of terminal space and other airport facilities. Since such leases do not provide for a transfer of ownership or a bargain purchase option, they are classified as “operating leases“. 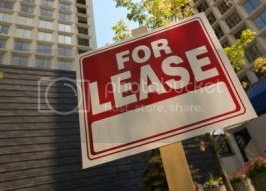 The leased property is owned by a governmental unit or authority. The leased property is part of a larger facility, such as an airport, operated by or on behalf of the lessor. The leased property is a permanent structure or a part of a permanent structure, such as a building, that normally could not be moved to a new location. The lessor, or in some cases a higher governmental authority, has the explicit right under the lease agreement or existing statutes or regulations applicable to the leased property to terminate the lease at any time during the lease term, such as by closing the facility containing the leased property or by taking possession of the facility. The lease neither transfers ownership of the leased property to the lessee nor allows the lessee to purchase or otherwise acquire ownership of the leased property. The leased property or equivalent property in the same service area cannot be purchased, nor can such property be leased from a nongovernmental unit or authority. Leases of terminal space or other airport facilities that do not meet all of these criteria are classified in accordance with the real estate lease classification criteria in Statement 13. Leases of other facilities owned by a governmental unit or authority that grant essentially the same rights to the parties as in the lease of airport facilities are also classified as operating leases. Facilities at ports and bus terminals are examples of such leases. Should Sale and Leaseback Be Repoted as Financing Activities?